June 26, 2010 June 27, 2010 Diana B. If you read this post of mine from early spring, you know what books have been on my nightstand and coffee table for the last several weeks. Now that it is summer, the Spring Reading Thing is officially over, and I’m ready to report back about some of the books on my list. Feathers from My Nest by Beth Moore is a beautiful, heartfelt work that inspires me to savor every moment with my daughters. A long-time fan of Beth’s Bible studies, I was delighted by this peek into her family life and church life, too. Beth is the ultimate storyteller, and so Feathers from My Nest is filled with fantastic stories about bringing up two lovely daughters — some will make you bawl your head off, some will make you roll on the floor, and some will make you do both. I was a little hesitant when I purchased this as an audiobook, but in retropect, I am so glad I did. Hearing Beth read the book while I drove felt like she was riding in the passenger seat of my minivan, telling tales and giving me advice mom-to-mom. It was priceless. So Long Insecurity also by Beth Moore (I do read other authors, I promise!) sheds so much light on women and why we do or say the things we do and say. The book is very worthwhile, and the powerful prayers in it can be life-changing. I started reading Bringing Up Girls while I was still reading this book, and I found several parallels, especially in regard to culture and women. I think God has a powerful message for women of today, and He’s used both Beth Moore and Dr. Dobson to pen it. 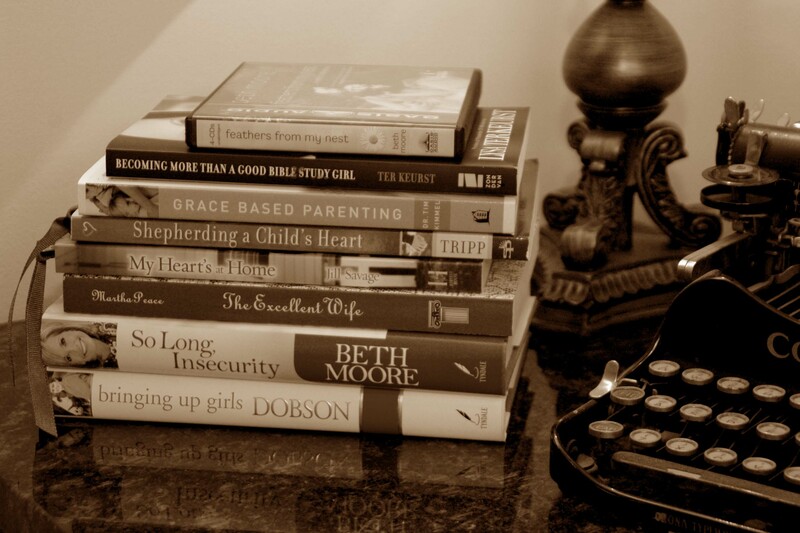 Shepherding a Child’s Heart by Tedd Tripp is still on my coffee table. I’m only few pages into it, but I plan to make reading it a higher priority since I hear over and over how wonderful this book is. Also on my reading list are Bringing Up Girls by Dr. James Dobson, The Excellent Wife by Martha Peace, Becoming More Than Just a Good Bible Study Girl by Lysa Ter Keurst, Grace-Based Parenting by Dr. Tim Kimmel, and My Heart’s at Home by Jill Savage. This summer, the girls and I are reading several science books by Gail Gibbons, as well as Mountain Born by Elizabeth Yates and Nora Spicer Unwin. Linnea is 200+ pages into The Secret Garden by Frances Hodgson Burnett, and she is doing her first somewhat independent Bible devotional: Mona Hodgson’s Real Girls of the Bible. Laurel, meanwhile, is working through Life Lessons from the Princess and the Kiss by Jennie Bishop and Susan Henson, and she is listening to me read some of The Secret Garden. We’re only on chapter two because we’ve been distracted by Sandra Boyton books lately. We have Shepherding a Child’s Heart by Tedd Tripp and have continued to re-read portions of it over the last couple years. Fun to see what you have been reading and what you recommend!